Cashews can help maintain your body's balance of minerals needed for optimum health, as they are high in mineral content, with copper being the most abundant. A 1-oz. serving of roasted cashews contains 0.6 mg of copper, which is more than 30 percent of the recommended intake set by the Institute of Medicine. Copper is needed by your body for the production of hemoglobin, collagen, elastin and the protection of nerve fibers. 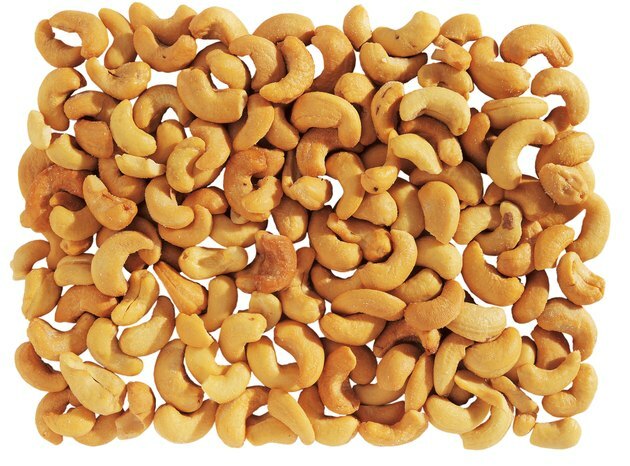 Other minerals in cashews include magnesium, phosphorus, manganese, zinc, iron, potassium, selenium and calcium. Cashews contain only a trace of sodium unless you purchase salted nuts. Cashews are beneficial for controlling blood sugar, according to a study in the December 2010 issue of "Molecular Nutrition and Food Research." In the study, researchers from the University of Montreal tested an extract from cashew nuts, which contains anacardic acid, on lab rats. The results of their study show that the anacardic acid improves the ability of sugar to enter cells, which decreases the amount of sugar circulating in the bloodstream. Cashews also may promote the metabolism of sugar into energy, a process called glycolysis. Controlling blood-sugar levels reduces the risk of developing diabetes, a condition often associated with obesity and heart disease.